I could not wait to share my Instant Pot Sunday Pot Roast with you all today! I made this last week on a super busy day, and my family was blown away at how incredible this dish turned out. The beef was so moist and tender, and was absolutely melting in our mouths. I barely even had to shred it much, because it just completely fell apart almost entirely on its own. Since I’ve made, my kids have not stopped asking when I’m going to make this again (this weekend, in case you’re wondering). And this is one dish that I will gladly make again and again because it is so easy. The magic of the Instant Pot continues to amaze me. If were cooking this pot roast recipe using my oven or slow cooker, it would take me 8-10 hours to achieve this kind of perfection. But in my Instant Pot, just 70 minutes to cook. Total cook time is around 90 minutes, once you factor in saute time and pressure release. Sunday pot roast dinners were a common thing when I was growing up. My mom would spend hours in the kitchen basting her roast and checking on it. But with today’s modern and hectic lifestyle, very few of us often have the luxury to babysit a roast all day long. So this instant pot recipe helps me keep that family tradition alive, without sacrificing my entire day in the kitchen. The recipe is basically identical to what my mom (and her mom) used, with just a few tweaks. No need to mess with perfection! I’ve been cooking it for years in my slow cooker, but now the Instant Pot has stepped up my game, and my family’s favorite pot roast recipe is now something I can cook on a more regular basis. Without a doubt, the best thing about this meal is the texture of the meat. I was so excited with how it turned out, and in such a hurry to get a photo of it, that I didn’t bother to top it will gravy or “decorate” it with garnish. Plus, it was a Friday night (this roast is not just for Sunday nights! ), and we were headed to my son’s football game. I was in a rush, my kids were starving, and I honestly just didn’t have the time. But the meat is so flavorful, and so juicy, you really don’t even need the gravy. But if you are a gravy person, I get it…I get it. Go ahead and make yourself some gravy to slather over the best pot roast recipe you’ll ever eat. A quick note about the potatoes…I prefer Yukon gold simply because they have a wonderful nutritional profile in comparison to other potatoes. But just about any kind of potato would work well. And baby potatoes are perfect if you want one less thing to chop. Regardless of which potato you use, they soak up the wonderful juices and flavors, and help make this a very hearty and satisfying meal. But if you want to shave off a couple of Points, just leave out the potatoes, it’s no biggie. I hope that you love my family’s traditional pot roast recipe as much I do! 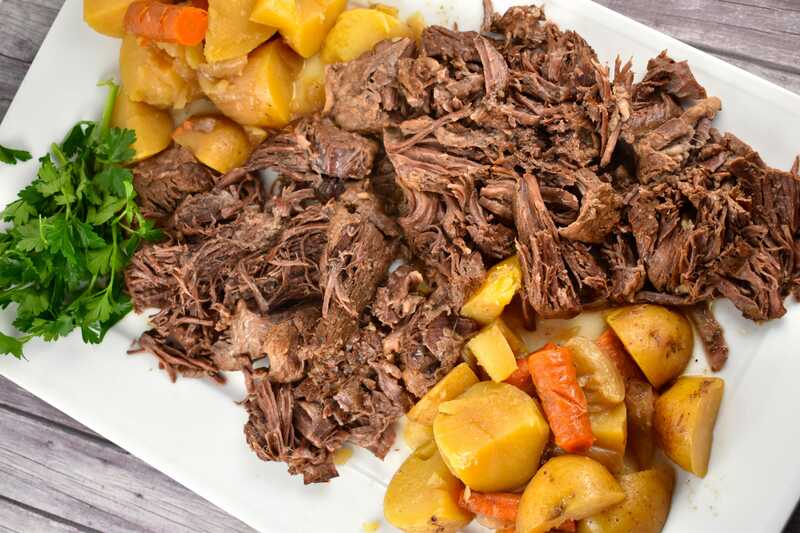 And once you see how incredible it turns out with the timesaving Instant Pot, you’ll be making this Sunday Pot Roast a part of your family tradition too! The most tender pot roast you can imagine in a fraction of the time it would take in your oven or slow cooker. The perfect, easy Sunday dinner that the family will love. Season both sides of roast with salt and pepper. In a small bowl, whisk together the broth, onion soup mix, and Worcestershire sauce. Set instant pot to saute. When hot, add in oil. Add in meat and saute on all sides...about 1-2 minutes per side. Top meat with potatoes, onions and carrots, and prepared sauce. Turn off saute. Cover Instant Pot with lid, and switch to manual setting. Set for 70 minutes on high pressure. Allow to naturally release for 10 minutes, then quick release whatever pressure is left. Remove from instant pot, shred and serve with vegetables. I do not have an Instant Pot. Can I make this in the Crockpot? Absolutely! Just cook on high for about 8 hours or low for 10 hours.